Any way you slice it, 2016 has been a tough year. We lost beloved novelists like Harper Lee and Gloria Naylor; lyricists like David Bowie, Prince, and Leonard Cohen; and book-character-embodying actors like Alan Rickman and Gene Wilder. We expressed a dip in mood in our writing online. One study by social media analytics company Crimson Hexagon showed that popular retail holidays like Black Friday experienced a rise in negative sentiment in 2016, despite rosy predictions. Similarly, sentiment analysis of the 2016 American election showed more negative emotions than ever before. One study published by the National Academy of Sciences in November even suggests that a well-known linguistic phenomenon, the tendency to use positive descriptors instead of negative ones, could be affected by this year’s political and cultural conditions. This means that, as negative as 2016 was, we could be feeling the linguistic effects for years to come. We even chose decidedly negative words to represent this year. The first two dictionaries to announce their “Words of the Year,” Dictionary.com and the Oxford English Dictionary, both explained that this year’s picks were far more somber than last year. The OED has named “post-truth” as 2016’s Word of the Year, while Dictionary.com chose “xenophobia.” Not to be confused for a positive choice, Dictionary.com’s announcement blog opines, “Despite being chosen as the 2016 Word of the Year, xenophobia is not to be celebrated.” Ouch. But instead of focusing on the doom and gloom that was expressed in 2016 online, it’s time we looked to the positive. Some great things happened in English this year, from the recognition of the singular they as an standard English to Christopher Marlowe finally gaining credit as Shakespeare’s coauthor. We wrote more than ever before, and we even added “squee” to the OED! So, in the vein of these positive achievements in writing, here is an intentionally constructive list of trends we think writers will see in English-language writing next year. As it has done for centuries, English will only get better with age, and we’re very excited for these three trends to continue in 2017. 1 Fake News . . . and Real Fact-Checking One of the most surprising discussions about writing in 2016 revolved around so-called “fake news” and the idea of a “post-truth” society. Major American publications’ sourcing and writing tactics were called into question, and many op-eds were penned on the importance of well-researched writing. We predict that this discussion will continue in 2017, but hopefully with more actionable discussions of citation, sources, and plagiarism than ever before. Google has already added a fact-check tag to its news services, and we expect that others will soon follow suit. 2 Informality Meets Function By now, some of our followers are probably tired of hearing about text speak, slang, and emojis, and for good reason. The English language is constantly evolving, and in 2016, we observed a startling amount of informal language being accepted by our users. And we weren’t the only ones! The scientific community made a massive shift toward less complicated language, while discussion of informal means of communication at work soared. Of course, some can take this opportunity to decry the “destruction” of the English language, but we don’t have to see it that way. As we saw in our trendy language study, slang does not necessarily mean shortening language, but it clearly is helping some of our users communicate in ways that make them feel more comfortable. We’re excited to see which grammar rules become myths in 2017, and which rules (like the Oxford comma) are here to stay. The number of indexed web pages grew by almost five billion from 2015 to 2016. Since the average web page contains 1,600 words, this represents a vast amount of written material. Over 2.3 million blogs are published every day, according to WordPress.com. The average blog post in 2016 was 1,054 words, meaning that over 2.4 billion words were written on blogs alone this year! At the time of writing, over 321 million tweets were being tweeted per day. Even if the average tweet is only 28 characters and only half are in English, this still represents almost 5 billion characters tweeted every day. Even if 2016 was a tough year for online writing, we think 2017 will bring an exciting new chapter for the English language. To quote the authors of the previously mentioned LPB study, “previous research has neglected an essential dimension of language: time.” Language has never existed in a vacuum, and we are excited to see the ways in which English will grow and change in the coming year. 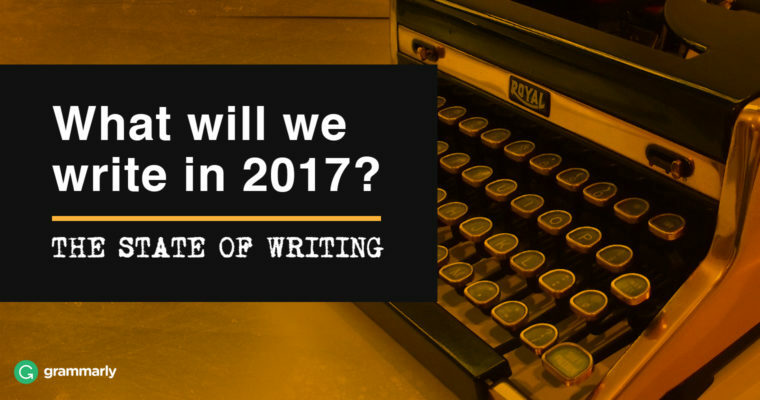 What do you think will happen in digital writing next year? Has your writing changed significantly in 2016? We’d love to hear your thoughts about effective writing in the comments below.